Variable area flow meters, also known as rotameters, consist of a vertical tube with an inlet at one end and an outlet at the other. Inside the tube is a float whose density is greater than the density of the fluid. As the fluid passes through the tube at varying speeds, the float rises or falls, maintaining a dynamic balance between the upward and downward forces acting on the float and the fluid. The height of the float in the tube indicates the flow rate. 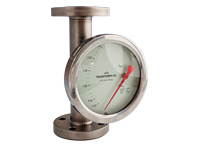 The metering tube includes a scale where flow rate can be read manually. Able’s wide range of standard VA meters and accessories cater for many applications requiring the measurement and control of liquids and gases. However, we are also able to design and manufacture solutions to fit more specific application needs where required.